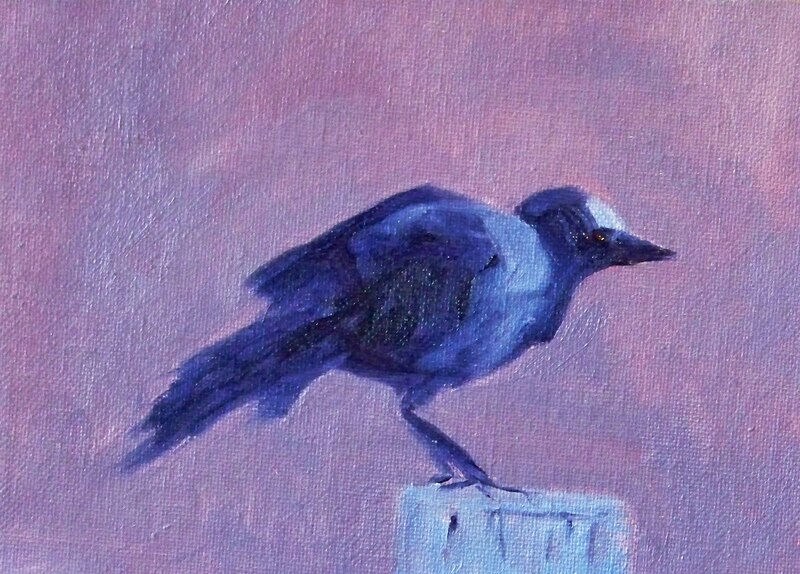 It was so much fun to paint the visage of a crow from my backyard a few days ago that I had to paint a few more. This guy was looking very serious, hunting for something. I wondered what it might be. Was it a worm in the garden or the entry of that pesky Jay that lives nearby? 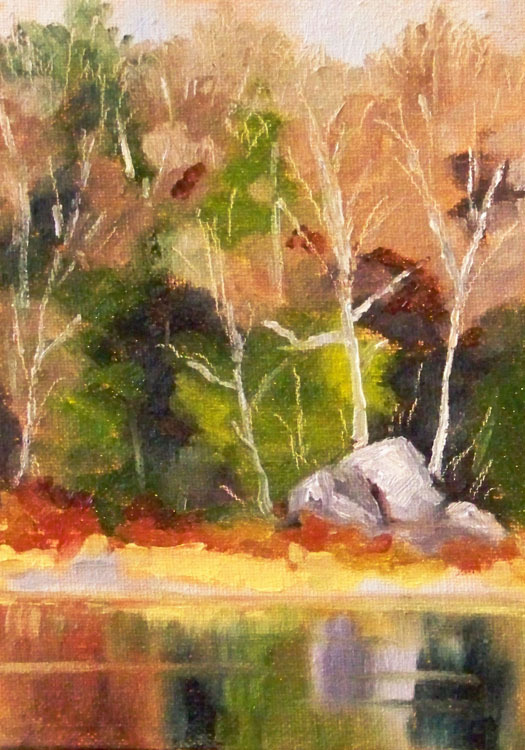 The painting is 5x7 inches and is one of several I will be posting over the next few days. 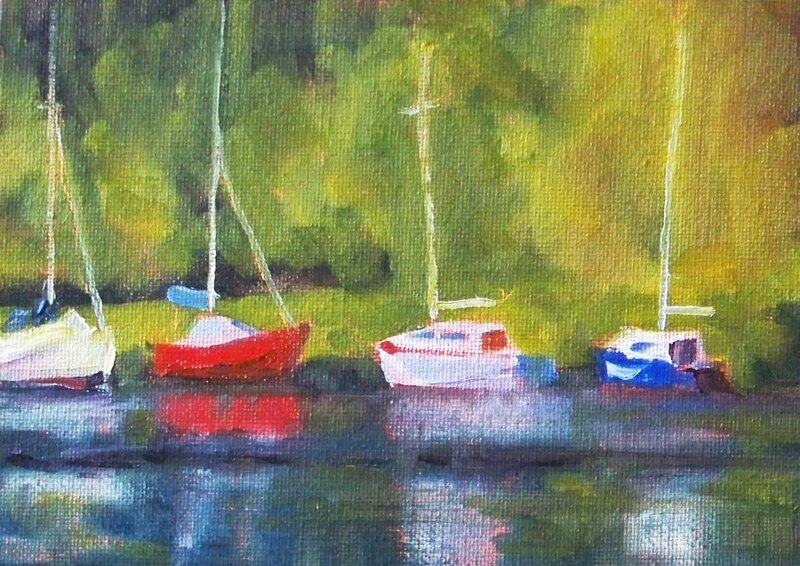 When the paintings dry, they will be offered for sale at Small Impressions Paintings. 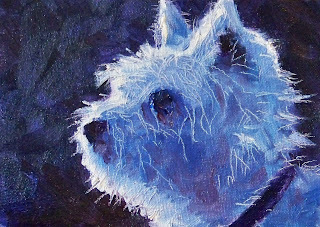 Today's painting is a 5x7 inch oil painting of a scruffy little pup. It was fun to try to recreate his fly-away fur that stuck out in every direction and a challenge to create the backlighting. Now that he is dry, he has joined some of my other paintings of birds and animals at the Small Impressions Gallery at Etsy. To purchase or view him in the gallery, click here. 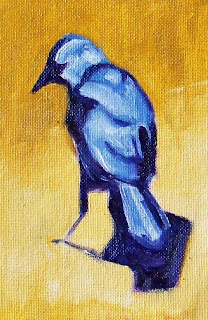 Today's 4x6 inch painting was inspired by a cranky crow who lives in my backyard. There's actually a pair of them that seem to be nesting in a nearby pine tree. They are big and very territorial. They are constantly after the Blue Jay's who try to steal a worm from the lawn. When the sun shines, it makes the black feathers of the crows glitter and appear to be made of of multiple shades blue and purple. It was with this image in mind that I created this painting. Now that it is dry, it has joined the Small Impressions Gallery with some of my other small paintings of animals and birds. To purchase or view it in the gallery, visit this link. It won't be long until these will be blooming in my yard. Sprouts are emerging and the brave crocus have lead the floral parade. I'm looking forward to painting these from life rather than from a photo. 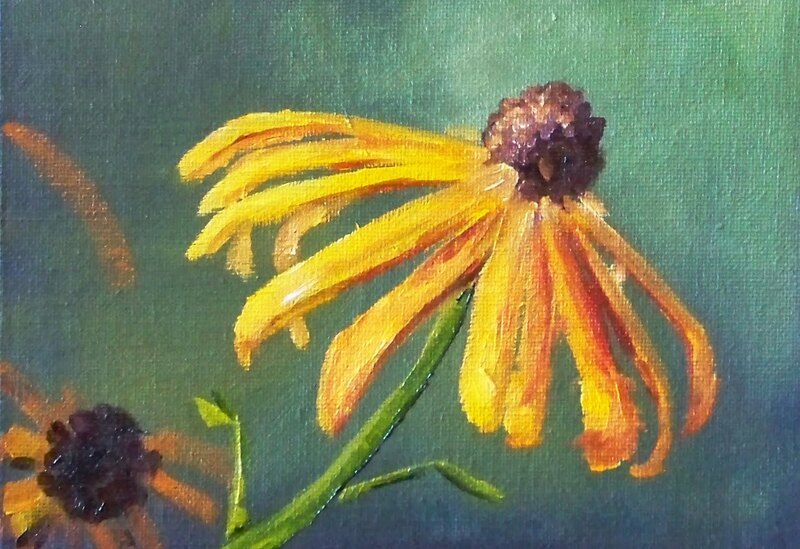 This painting is 5x7 inches and has joined some of my other floral paintings in the Etsy Gallery . Click this link to view it in the gallery or make a purchase. The first day of spring has passed and most of us are hoping the snow is long gone as well. 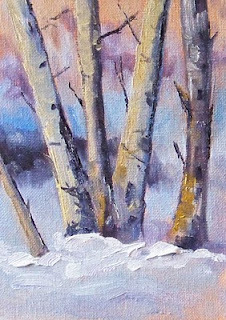 In celebration of the official end of winter, I painted this 5x7 inch oil painting of clustered trees huddling together in the snow. It has been a difficult winter and I hope this painting will truly be the end of the ungliness and cold that visited so many. 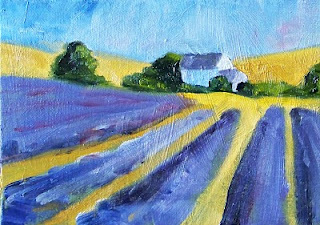 The painting is now for sale with some of my other small landscape paintings in the Small Impressions Gallery. Click here to view and purchase. Yesterday I visited Wetcanvas, a website for artists, that has a wonderful forum for sharing photos and ideas. It has been a long time since I stopped by, but on my visit, I discovered a landscape challenge for the month of March. This 5x7 inch oil painting was based on one of the photos in the challenge. I chose it because of the sunny feel and I was very tired of the rain. It cheered my day and I hope will cheer others as well. 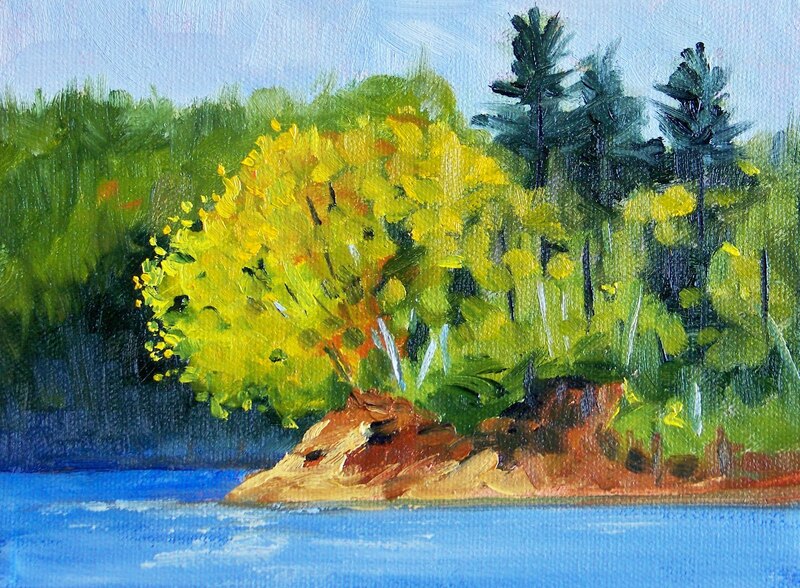 It can be purchased for $40.00 plus shipping by visiting the online gallery, Small Impressions. Click here to view it in the gallery or put it in your shopping cart. 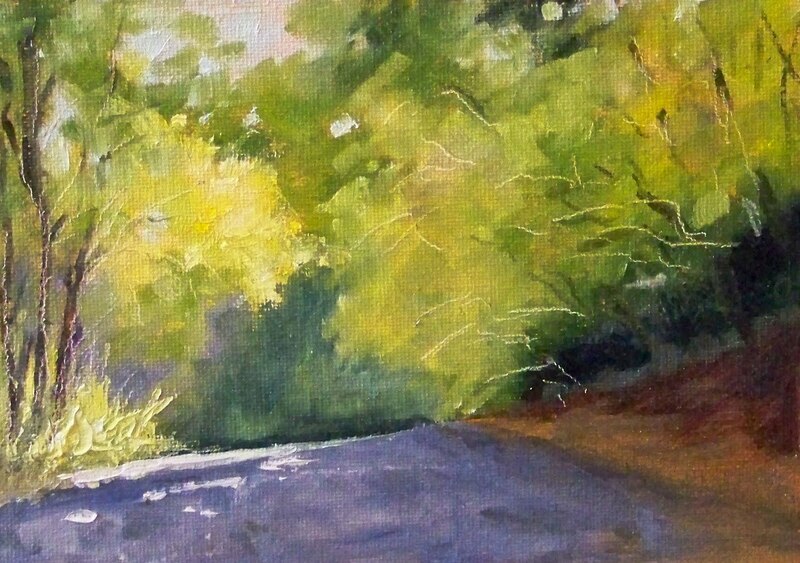 Walking down the road and noticing sunlight as it flickers across the pavement is what inspired this painting. 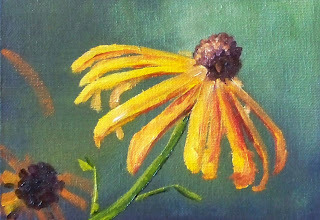 That sliver of light in the left corner is intended to be the star of this 5x7 inch oil painting. I'm doing some auditions for a larger painting that I want to create. Haven't decided yet if this will be the subject or not. This small painting can be purchased at the Small Impressions Gallery for $40.00 plus shipping. Click here to view it in the Gallery or put it in your shopping cart. Earlier in the week, I was thinking about summer time and warm weather. Today I'm thinking about reality. 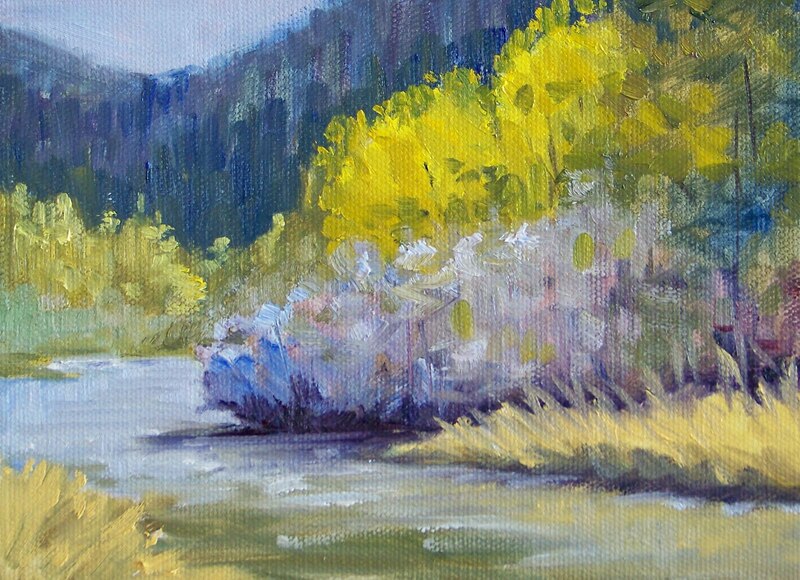 This 6x8 inch oil painting reflects the colors of early spring. Some of the trees are starting to show buds, but the color of the landscape is still cool. The summer season is around the corner. The change to daylight savings time this weekend was very welcomed and I look forward to the longer hours of daylight that will allow for more painting. 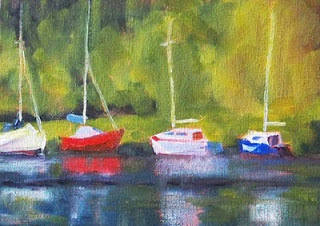 This 6x8 inch oil painting was created on a gallery wrapped canvas while I sat and listened to the rain. It is based on a photo that reminds me the rain won't last forever. So, I sit and dream of warmer days. Eventually it will enter the Small Impressions Gallery and be available for purchase. It has been an interesting day. Started yesterday with a trip to the Washington State Coast and a debate with my husband about the safety of heading toward the shore soon after a tsunami warning. He won; we visited; all is well. It turned out to be a non-event for our location though a tragedy for Japan. As I sat inside, looked at the pouring rain, and contemplating our good fortune, my brush tilted towards painting warm things. This 4x6 inch painting of lemon quarters on a red cloth resulted from my musings. I almost forgot about this little painting. 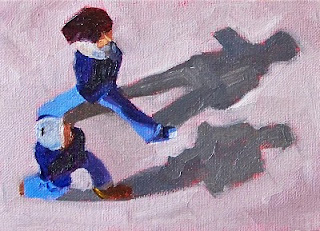 It is 6x8 inches as was painted one morning when I arrived home from a grocery run. 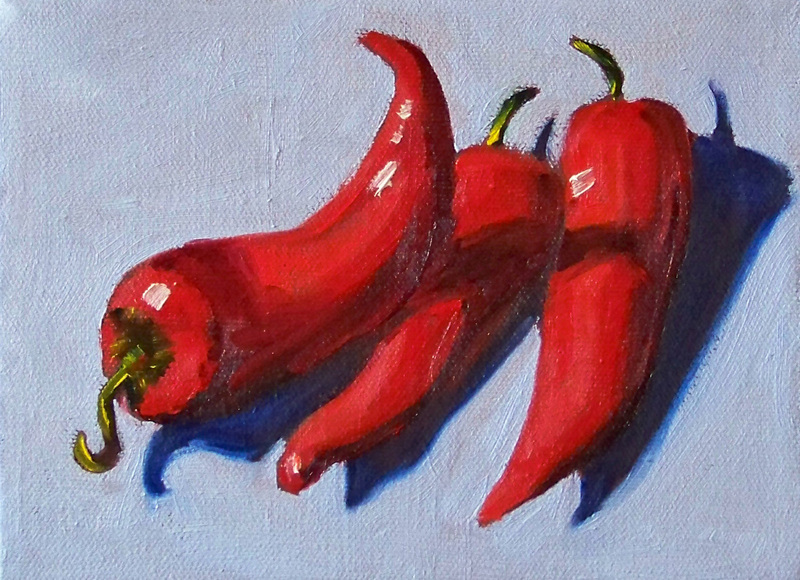 Their bright red color of the peppers demanded that I put them on the table and paint first thing when I got home. 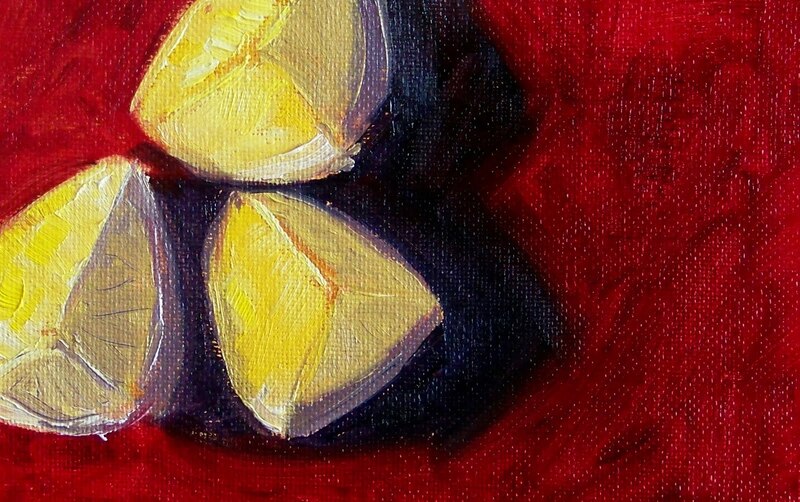 The painting is dry and for sale with some of my other still life paintings at Etsy. Click here to view it in the gallery or make a purchase. It can be purchased for $65.00 plus shipping. The sun came out today. It got me thinking about the coming summer months. Lazing my day away on a sailboat or a warm, grassy shoreline sounds like a good option. This little 5x7 inch painting was created with a wish for the coming days of summer. It is for sale at the Small Impressions Gallery at Etsy and can be viewed or purchased here. 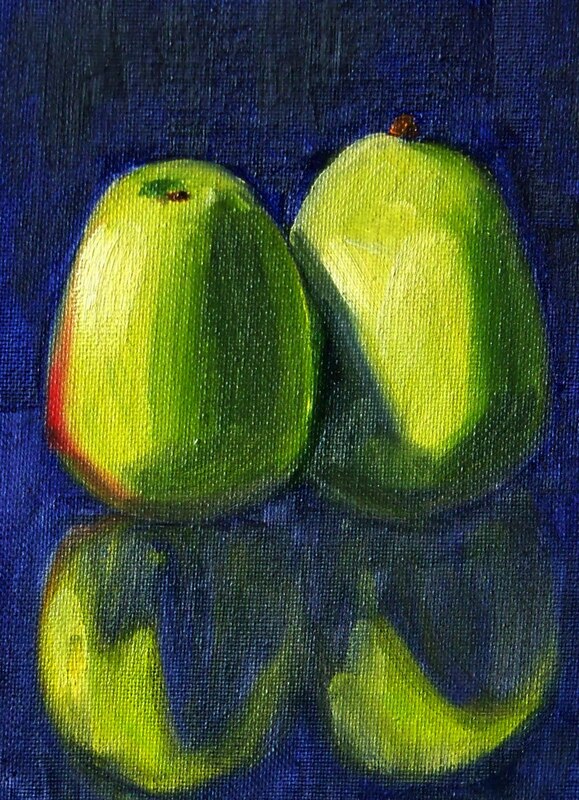 This morning I sat a couple of green pears on the case of my laptop. The dark shiny surface provided a wonderful reflection and I loveed the contrast of the bright green with the darkness. Needless to say, my brush got to work and quickly covered the canvas. The painting is 5x7 inches and will eventually find its way to the Small Impressions Gallery where it will be listed for sale with my other small fruit paintings. Today's painting was just plain fun to paint. A Couple of young ladies taking a walk on a sunny winter afternoon inspired this abstract painting. It is 5x7 inches on a canvas panel. This is the third of my recent farm scapes. It won't be too long until the lavender begins to sprout new folliage and share its wonderful aroma with all who are fortunate enough to encounter it. 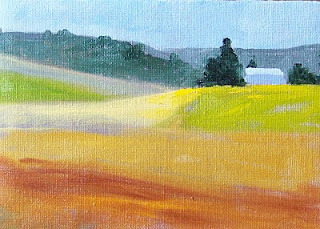 This painting is 5x7 inches has been listed for sale with some of my other paintings of fields and landscapes in my Gallery at Etsy. Click here to view it in the Gallery or put it in your shopping cart. It can be purchased for $35.00 plus shipping. Today's painting is another one of my recent forays into landscape painting. I liked the simplicity of it. 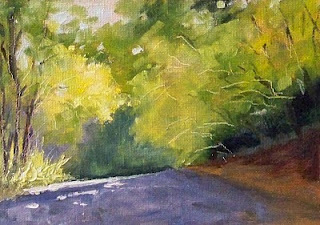 A few blocks of color covey the delight of a summer scene. The painting is 5x7 inches on a canvas panel and can be purchased for $35.00 plus shipping at the Small Impressions Gallery. Click here to view it in the gallery or drop it in a shopping cart.